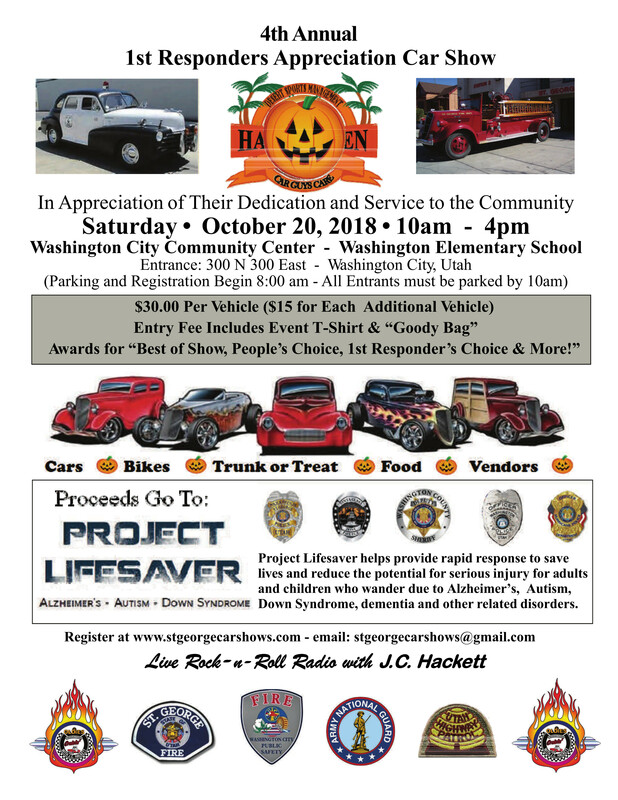 ST. GEORGE — First responders in the U.S. respond to more than 240 million 911 calls a day, and in honor of their service to communities in Washington County, Desert Sports Management and Car Guys Care are hosting the 4th annual “First Responders Appreciation Car Show” Oct. 20 from 10 a.m. to 4 p.m. The event will be held at the Washington City Community Center located at the Washington Elementary School and will feature classic cars as well as first responder and emergency vehicles. Registration/parking for show vehicles is open online and is $30 for the first vehicle and $15 for each additional vehicle. In addition to the car show, there will be many more attractions, including music and concessions, as well as bounce houses, “trunk or treat” and a bike rodeo for the kids. Additionally, a “Ninja Warrior”-style obstacle course is being set up and hosted by The Grip, and JC Hackett will be kicking out live rock-n-roll radio. DUB’S BBQ will also be on hand cooking up award-winning pork and other favorites. Through working with Car Guys Care, Darren Nuttall of Desert Sports Management and the group created the event around a purpose years ago, which is to honor the first responders in the area, he said. Part of that mission includes donating proceeds from the car show to a program many first responders hold near and dear: Project Lifesaver. Project Lifesaver has been proven the most effective search and rescue program. It uses a LoJack SafetyNet tracking system designed for “at risk” populations – from children with mental disabilities to adults with Alzheimer’s – reducing the time, funds and manpower needed to locate an individual. More than 1,200 law enforcement departments nationwide use the system. A timely response can save lives and reduce the risk of injury for such adults and children who become lost, and the Project Lifesaver system has the ability to detect or track an individual who may wander into a shallow body of water, a densely wooded area, a concrete structure such as a garage or a building constructed with steel. The average recovery time is less than 30 minutes. 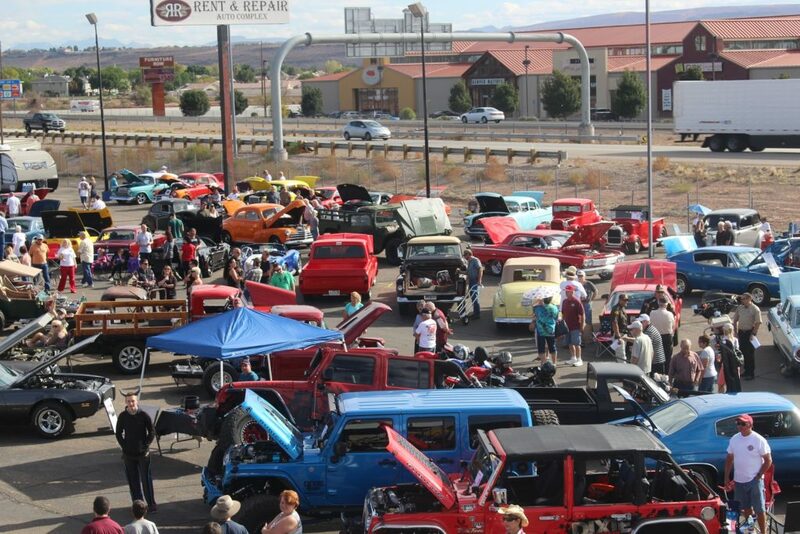 Those participating in the carnival and car show include city of St. George officials; police officers from St. George, Hurricane, Santa Clara, Ivins and LaVerkin; firefighters from St. George, Santa Clara and Ivins; the Washington County Sheriff’s Office; Gold Cross Ambulance; and Intermountain Life Flight. Units from the 141st and 222nd National Guard division will also be on hand, arriving in a Paladin artillery piece that is similar to a tank, but in reality is the most prolific self-propelled howitzer outside the Soviet Union, upgraded to such an extent that it is still in service today. What: “First Responders Appreciation Car Show” and Halloween carnival sponsored by Car Guys Care and Desert Sports Management. When: Saturday, Oct. 20, 10 a.m. to 4 p.m.
Where: Washington City Community Center at Washington Elementary School, 300 N. 300 East in Washington City.